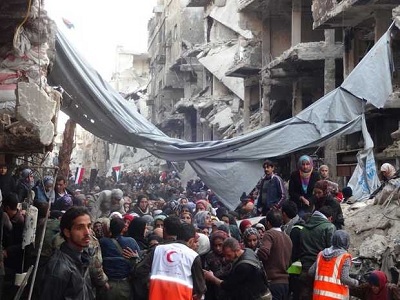 Syria’s al-Qaeda-linked group Jabhat al-Nusra has began pulling out of a Palestinian refugee camp of Yarmouk in southern Damascus, according to Al Jazeera sources. Palestinian fighters started to replace the armed rebels of Jabhat al-Nusra on Tuesday, following a deal reached a day before that aims to “neutralize” the besieged camp where many have starved to death. The deal – negotiated by representatives of the Palestinian Popular Front – also enabled explosives experts to enter the camp to remove landmines from the area before the return of the residents. Delivery of humanitarian aid supplies and evacuation of the critically ill and injured residents is expected to follow. The agreement is a result of two-month-long negotiations for resolving the humanitarian crisis in the camp, Hamas executive committee member Osma Hamdan said. Palestinian authorities started talks with the Syrian government as well as various regional and international organizations on January 12 after Syrian opposition activists posted pictures on social media, showing cases of people who had starved to death in the camp. At least 86 people died in the camp because of the siege imposed by the Syrian regime since last June 2013, the Syrian Observatory for Human Rights reported.